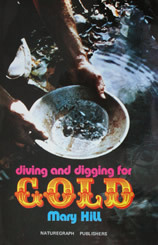 A quick and easy read for anyone interested in learning about diving for gold. Has lots of helpful illustrations. This book is a 5.5" x 8.5" paperback with 48 pages. Removing gold from private or public lands can result in criminal or civil liability. Know the laws for collecting before you go into the field.